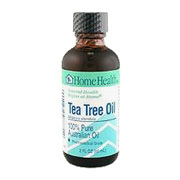 Tea Tree Oil is a pure oil derived from the leaves of small myrtle family tree that is native to Australia. Tea Tree Oil has anti-fungal, antibacterial, anti-viral, and antiseptic properties, which may be beneficial for colds, flu, cold sores, warts, inflammation, acne, burns, candida, foot odor, and athlete's foot. Add one or two drops to a moist cotton pad for application to appropriate skin areas. Warning: Keep out of reach of children and animals. Do not apply to children and animals. For external use only. Avoid contact with the eyes. Tea tree oil, 100% pure Australian oil. Tea Tree Oil is shipped in a discrete, unmarked package. Orders are processed immediately and usually take about 3 to 5 working days to be received. We do ask that you try it for 2 to 3 weeks to feel the full effects. Any information received is used only for order processing and shipping purposes. Your information, such as e-mail address, will never be disclosed to a third party.